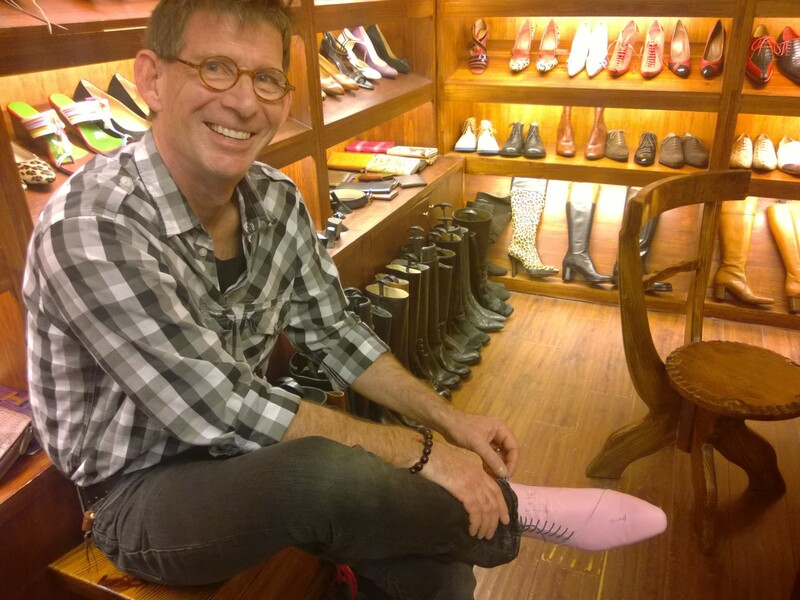 Shanghai Farewell Tour-Designing Clothes and Shoes Oh My! When in China, right? 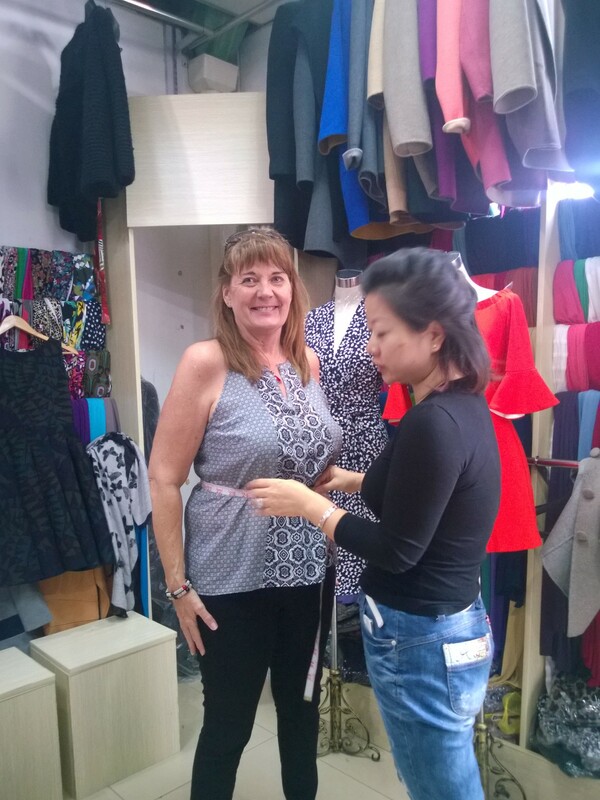 I had been here a whole year and never gotten custom tailored clothes but with less than 10 days left for me here, I threw caution (and a few hundred RMB) to the wind and decided I would always regret not doing it so off to the South Bund Fabric Market we went! HOT DAMN AND HOLD ME BACK-It’s time to design some fashion to remember my stay in China! Planning ahead with my favorite shirt in tow as a sample, we hit the market after negotiating for yet more jewelry from the street vendors. 10 RMB ($1.50US) for earrings! Thom made a new friend with the sales lady from Tibet and I got some cool Christmas presents. The market here is three floors consisting mostly of tailors hawking Chinese dresses, suits, outerwear, dresses, etc. so it can be very overwhelming with aggressive hawkers, “LADY, YOU NEED A SUIT?? 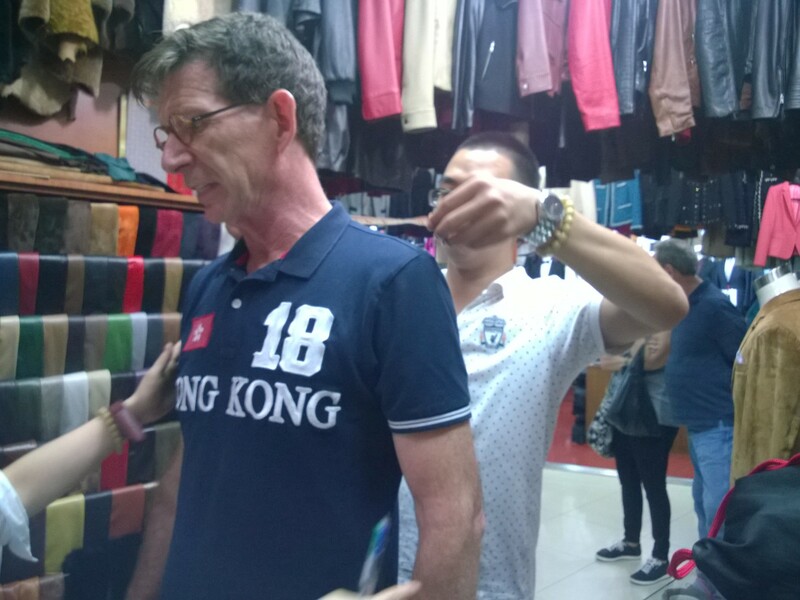 ?” We had gotten some tailor recommendations from our expat group but, of course, forgot the info so we wandered around. Before you start selecting fabrics and start to negotiate for “best and final friend price”, decide what you are willing to spend and then let the fun begin. I originally went to just get a French cuff business shirt and a knock off of my favorite knit shirt from Kenneth Cole. We got all the way to the third floor before I found a knit vendor and a friendly merchant named May. She and I picked out fabrics, colors and went over the design to replicate my sample shirt with long sleeves instead of short. For only 150 RMB, I’ll be getting two knit shirts custom tailored to my specs and designed by me in the colors and fabric I picked out. I’m thinking these will quickly become my most flattering and favorite shirts-pics to come. Thrilled to be designing again (back in the day I was a clothing buyer), I asked her to guide me to a vendor to create my cotton French cuff shirt next, knowing she would get guanxi (good will) from this referral. The next tailor was not so conversant but together we managed to design a special shirt with a different pattern for the inner collar and cuffs to spice up the classic white shirt. Picking out the collar design and the cuff style, we were done and I parted with 120 RMB($20 US) for my shirt that hopefully will fit better than any I can get off the rack at Zara. I redesigned this dress in dark grey with long sleeves, lower neckline and longer length. By then, Patti had gotten the designing fever and decided she just had to join in and started trying on coats with my new tailor friend, May. Opting for a classic car coat style in brown with a lining to be picked out by May, who by know we trusted explicitly, I started to try on dresses. 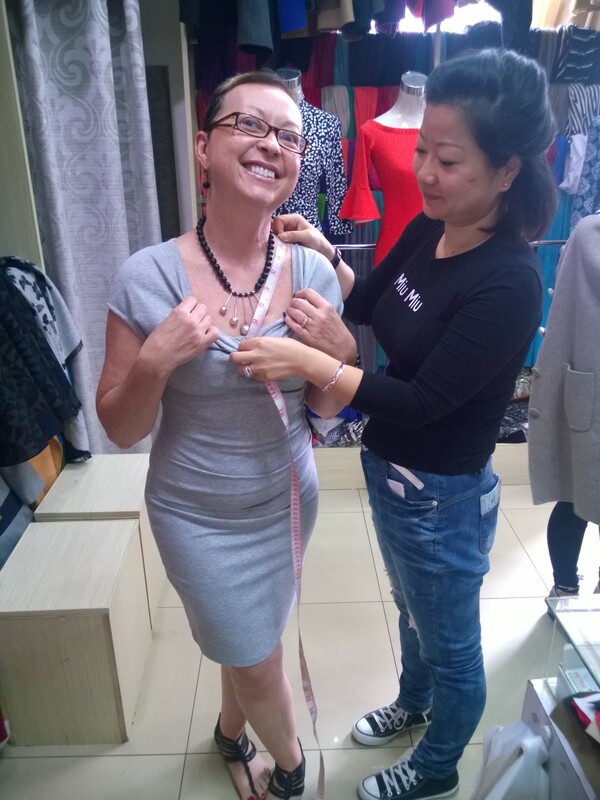 I had been a dress buyer a long, long time ago and designed lines myself of dresses so I had a great time picking out fabrics and taking one of their sample dress as a template to lengthen, change the sleeve length, lower the neckline in a dark grey heavy knit fabric. The fact that I could shimmy my way into their sample size dress at all was a minor miracle. Can’t wait to see the finished dress! Now it was Thom’s turn to get the cool biker leather jacket he has been dreaming of with zipped gusset sleeves and soft leather that was the “good stuff”, which meant more RMB. 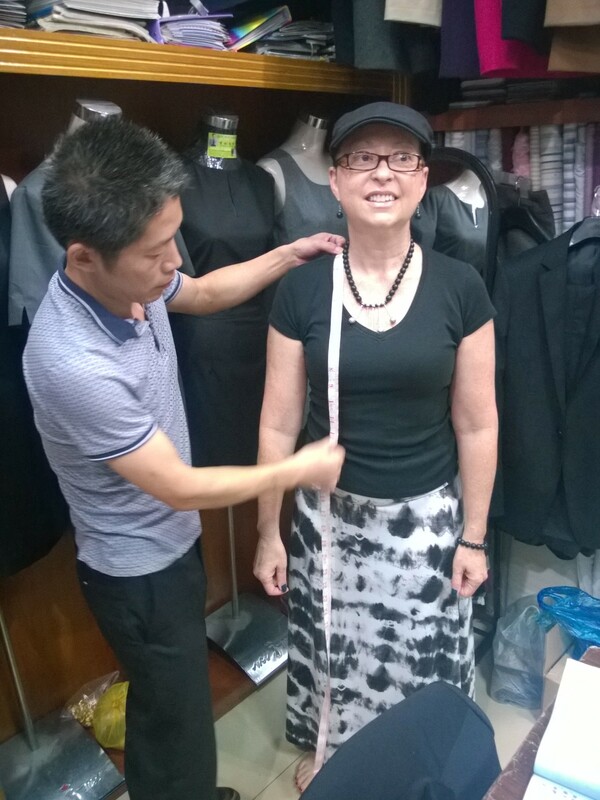 While I shopped for dragon cuff links to go with my new shirt, he was measured by two tailors who appreciated that he was one of the few expats able to actually fit into their samples, being the tall thin dude that he is. Let’s face it, most expats here have drank a few too many steins of beer and are carrying 50+ extra pounds. Not my fit and trim hubby-he loves fashion and isn’t afraid of some style in his wardrobe. As you can see by the picture, he also isn’t afraid to make a fashion statement, rocking his Hong Kong shirt in support of the protestors. Thom will be styling’ in Seattle with his custom made boots and custom tailored leather jacket. We went for his initial boot fitting last week and the ombre grey side stitched boots with red trim will be done before we head home. 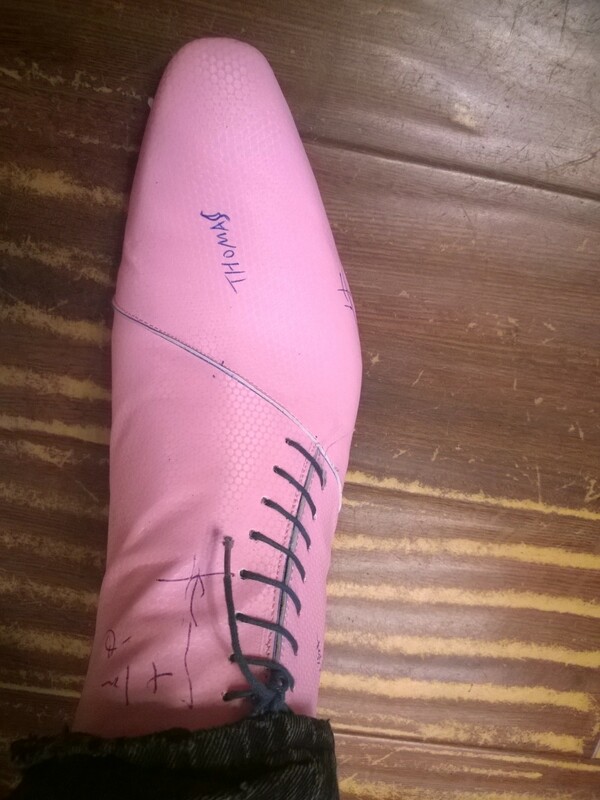 Yes, the boot model for his first fitting is pink but the final result will be a work of art, designed from several styles to incorporate an inner zipper, side accent laces (red) with toe stitching in red as well. We love our shoes and will also fondly remember our adventures in China as we stroll the streets of Seattle sipping our Americano’s from Stumptown.